Basic find and replace operations are a form of regular expressions. Regular expressions are also referred to as regex or regexp. Advanced operations of regular expressions allow more control of matching patterns. Matching patterns can be set to matching the entire document, the first instance, or part of a word. This tutorial uses Perl-derivative regular expressions. The regular expressions can be used on any text file any any application that supports regular expressions. Many programming languages support regular expressions that are similar. 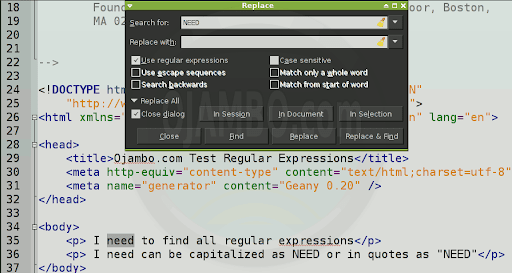 Text editor with support for regular expressions. Word Processor with support for regular expressions. Optional Perl-like language such as Awk, Perl or PHP. The regular expressions cheat sheet can be used in future projects. Keep the expressions simple and use as needed. The Perl-like syntax is the most common and can be applied in text editors, word processors and programming languages. This tutorial uses an optional lightweight programming editor with regular expression support. The regular expression concepts can be applied to other programming languages. This entry was posted on Wednesday, July 20th, 2011 at 12:00 am	and is filed under Tips & Tricks. You can follow any responses to this entry through the RSS 2.0 feed. You can leave a response, or trackback from your own site.